Some of the newest machines on the market are the Silhouette Curio and the Cricut Explore Air. They have some similarities, but there is a lot of differences between the Curio and Cricut Explore. Let’s take a look at these two machine reviews. The Silhouette Curio Machine is a companion tool to the Silhouette Cameo. The Curio is fuCuriolly functional and is loaded with features, such as embossing, stippling, and etching, features that are not available to the Cricut Explore Air machine. The Curio does have a lot of features, but one of the downsides is that it isn’t that powerful. For example, if you want to etch, you’ll only be able to do it on thinner and lighter material, as the pressure of the machine is only 210 grams. Similar to the Cricut Explore Air, the Curio has dual carriages, which means you can mix and match tools. This saves time by not having to stop the machine to swap out the various tools. It’s also really neat to use two colored pens at once on the same project. A big consideration when purchasing a die cut machine, such as the Curio, is the software. The Curio comes with the Silhouette Studio Designer, which is software allowing users to create their own designs from scratch. Even if you aren’t a designer, the software allows you to import or purchase designs from elsewhere. There are a lot of features with the Silhouette Studio Designer, so there may be a learning curve when first getting started. If you are comfortable using graphics software, you’ll be able to catch on more quickly. The Cricut Explore Air has been around longer and is more popular than the Silhouette Curio. The Cricut Explore machine can cut and draw up to 12 x 24 inches. Like the Silhouette Curio, it also comes with dual carriages. However, the Cricut Explore is limited to cutting and drawing. Tools for embossing and engraving are not available for the Cricut Explore. The Cricut is also Bluetooth and Ipad compatible (Ipad 2/Ipad Mini and newer), so you can cut wirelessly. The Cricut also has a Print and Cut feature, so you can print images from your printer and have the Cricut machine cut them out. The Cricut Explore is one of the easiest machines to use. One reason is because of the simplicity of cutting. The machine has a Smart Set Dial, which is a knob on the outside of the machine that allows users to easily adjust blade depth and pressure according to the material being cut. 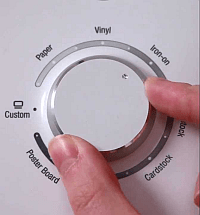 For cutting special material, there is a custom option where the settings can be adjusted using the Cricut Explore Software. Another reason that makes the Cricut Explore simple to use is the Design Space Software. Design Space is a user-friendly friendly software that makes importing files easy to use. If you an advanced user who wished to create designed from scratch within Design Space, you’ll be better off using a 3rd party software instead to import the file for free. One consideration when using the software is that it is cloud-based. All your designs are stored in the cloud, but it also means an internet connection is required. Below you can compare the differences between the Silhouette Curio and the Cricut Explore Air, and find out which is best for you. What machine is stronger, the Silhouette Curio or the Cricut Explore? While both machines have a lot of differences, if you are wondering which machine is stronger, the Cricut Explore is stronger than the Silhouette Curio. The Cricut Explore isn’t the strongest die cut machine on the market, but it can cut more materials than the Silhouette Curio. The Cricut Explore comes with a German carbide blade, making the blades last longer. Deep cut blades are available for both machines. It should be noted that the Silhouette Curio can cut some of these materials, but not at the thickness that was tested. For example, you can cut magnet using the Silhouette Curio, but you need to use Silhouette’s magnetic paper. One of the big differences between the Silhouette Curio and the Cricut Explore is the software that the two machines use. Which is better, the Silhouette Curio or Cricut Explore? When it comes to the Silhouette Curio vs Cricut Explore and deciding which one is better, it does depend on what you are looking for. Overall, the Cricut has received much more positive reviews than the Curio. If you want a die cut machine that is easy to use that isn’t complicated, consider the Cricut Explore. 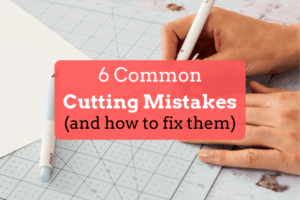 The Cricut is stronger than the Curio, but the Design Space Software requires an internet connection and isn’t really built for creating designs from scratch. If you want more freedom to create your own shapes, consider getting the Silhouette Curio or even Cameo cutting machine. 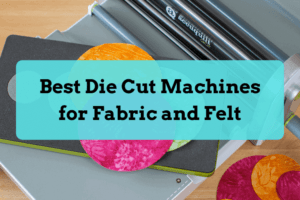 The software is powerful, but the downside is that the Silhouette’s cutting force isn’t that powerful, so you won’t be able to cut as many materials as the Cricut. You will also need to upgrade the software to be able to import .svg files.